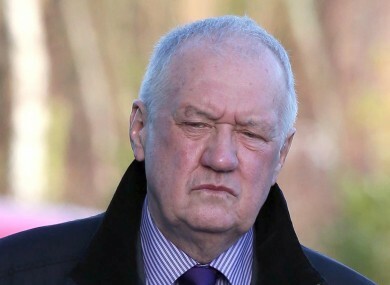 David Duckenfield is giving evidence at the new inquests into the death of 96 Liverpool fans at Hillsborough. THE SENIOR POLICE officer in charge when 96 Liverpool fans were crushed to death at Hillsborough nearly 26 years ago has told a jury he “was probably not the best man for the job on the day”. Former South Yorkshire police chief superintendent David Duckenfield has told a jury at the fresh inquests that he had “no recent experience” of policing at the Sheffield Wednesday ground prior to the disaster on 15 April 1989, according to BBC News. The 70-year-old is giving evidence for the first time at the inquest. These are his first public comments about the disaster in 15 years. #Hillsborough: Mr Duckenfield says, with hindsight, it was a 'serious mistake' for him to continue in the role of match commander. The new inquests were ordered after the previous verdict of accidental death was overturned in 2012. The Liverpool Echo says that he told the the inquest has heard that Duckenfield had one season’s experience at Hillsborough as chief inspector. With hindsight, I should have thought about my limited knowledge of the role of the commander in a major event that was an all-ticket sellout, when I had not been responsible, or in that responsible position, previously. All I would say is this, that after a period of… shall we say, I’m older, hopefully wiser, probably I wasn’t the best man for the job on the day. The jury has previously heard that about 2,000 fans entered through an exit gate at he Leppings Lane end of the ground after Duckenfield ordered that it be opened. Many of these fans ended up in central terrace pens where the disaster unfolded. The hearing in Warrington continues. Email “'I probably wasn't the best man for the job on the day,' says Hillsborough police chief”. Feedback on “'I probably wasn't the best man for the job on the day,' says Hillsborough police chief”.